At a news conference, Calit² division director Ramesh Rao and others explained how the WIISARD system will work, and the technology involved; to watch streaming video of their presentations, click here. San Diego, October 23 2003 -- The use of sophisticated wireless technology to coordinate and enhance care of mass casualties in a terrorist attack or natural disaster is the focus of a new federally funded research project at the University of California, San Diego (UCSD). The project brings together broad-based participation from academia, industry, the military, and emergency responders from the City and County of San Diego. Called the Wireless Internet Information System for Medical Response in Disasters, or WIISARD, the project is funded by a three-year, $4.1 million grant from the National Library of Medicine, one of the agencies of the National Institutes of Health, to the UCSD School of Medicine ($3.6 million) and the VA San Diego Healthcare System ($0.5 million). 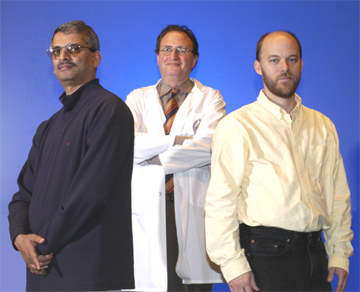 Calit² division director Ramesh Rao (left) and layer leader Bill Griswold. The WIISARD project director is Leslie Lenert, M.D., UCSD associate professor of medicine and chief of the Laboratory for the Study of Patients' Preferences at the VA San Diego Healthcare System. In addition to his medical background, Lenert holds an M.S. in Medical Information Sciences (now called Biomedical Informatics) from Stanford University. "We believe that the current technologies supporting acute field care of victims of disasters are simply inadequate," Lenert said. "The new technologies deployed by WIISARD will bring cutting edge wireless Internet technologies from the hospital to the mass-casualty field treatment station. Essentially, WIISARD is designed to overcome significant problems experienced in recent terrorist attacks." To develop a WIISARD prototype and test it in simulated disaster drills, the UCSD/VA team will partner with researchers from the California Institute for Telecommunications and Information Technology [Calit²], its members in industry (including QUALCOMM, Verizon Wireless, Ericsson, and PhilMetric) and the military (including the U.S. Navy's Space and Naval Warfare Systems Command), and faculty from the UCSD Jacobs School of Engineering and the San Diego Supercomputer Center. A vitally important component of the project is participation by the San Diego Metropolitan Medical Strike Team (MMST), one of the first such teams established nationwide in 1996. The MMST is composed of fire fighters, police, FBI, Hazmat teams, paramedics and San Diego City Emergency Medical Services, San Diego County Public Health and hospital representatives, among others. Under current disaster plans, initial responders provide an immediate scene assessment, followed by the establishment of a disaster command center. At the disaster scene, field providers evaluate patients, provide treatment, and prioritize individuals for transport to medical facilities. In the event of mass casualties, however, emergency personnel could be overwhelmed with thousands of victims in an environment contaminated with hazardous materials -- a setting fraught with inaccurate information, hampered communications and limited resources. Rather than attempting to create new software systems and devices to meet the needs of mass casualty care, WIISARD will customize existing software and hardware, and integrate existing systems. The result will be a first-of-its-kind wireless medical-response system for mass casualties. - Transmit medical data from the field to hospitals in a secure manner, and provide a record of patient transfer to specific hospitals. 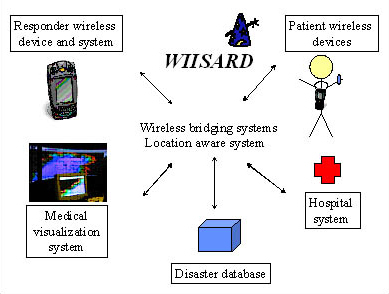 The many components of WIISARD will address various needs identified in the analysis of recent disaster response scenarios. To resolve this problem, WIISARD will utilize hand-held PDAs based on wireless devices currently used by students at UCSD's Sixth College to locate and communicate with friends via clickable maps. WIISARD's medical sensors will provide real-time data to field personnel and the command center, thus avoiding one of the tragedies of the 2002 terrorist attack in a Moscow theater. When the Russian government used a gaseous agent to disable the terrorists, more than 100 of their hostages died. Medical personnel later reported that most deaths were due to lack of vital signs monitoring at the scene and an inability to organize care to determine who was breathing and who wasn't. Lenert noted that an example of contamination from weapon "hot zones" is the 1995 Sarin nerve-gas attack in a Tokyo subway. More than 100 emergency responders at the scene were injured and one-quarter of emergency room hospital staff became symptomatic, through cross-contamination from victims. WIISARD's PDAs will have an Active First Responder (AFR) system designed to provide situational awareness to providers and the command center, so that responders don't accidentally move into hot zones. Initially, hot zones will be manually designated by the Incident Commander. As more data become available, computer models of weather and weapons' effects will be used to predict hot zones. The patient-location devices will also have the capability to alert the command center if patients attempt to leave the area, resulting in contamination of others. "Where technology can make a big difference is in awareness of danger zones for emergency first-responders and patients," said Theodore Chan, M.D., MMST medical director. "For example, we saw in 9/11 that the scene commanders didn't know where providers were in the World Trade towers. They couldn't communicate to those in the second tower that the first tower had collapsed." 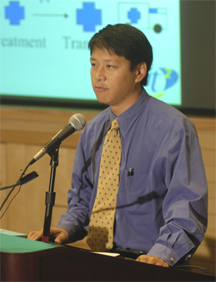 A UCSD associate professor of clinical medicine, Chan will head the WIISARD Applications Committee that will set clinical specifications for software and hardware, and review the designs produced by working teams, and the plans for systems evaluation. 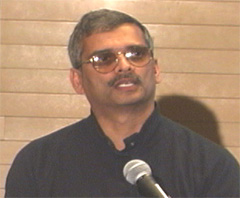 Ramesh Rao, Ph.D., who is co-PI on this effort, is also the UCSD division director of Calit² and a UCSD professor of electrical and computer engineering in the Jacobs School of Engineering. "Neither the clinical nor the technology side of this project would be feasible without the broad base of academic, scientific and community participation," Rao said. "From the very beginning, we have focused on getting engineers, physicians, computer scientists and community organizations to work together to solve problems of society that transcend what any one group could handle. WIISARD is a perfect example of that." He added that WIISARD is a Calit² prototypical "living labs" project in which the research is enhanced by prototype deployment and use in the field to address the real needs of first responders. During the first year of the project, researchers will develop and test individual systems. Components will be merged during the second year and tested using the campus wireless network. During the third year of the program, WIISARD will be tested in various campus disaster scenarios, and during an MMST disaster drill. WIISARD will be based on third-generation wireless technology, (802.11, 1xEVDO, and other standards), which can provide adequate support for high-speed transmission of medical and other data from local fire fighters, hospitals and emergency medical responders to a command center operated by the County of San Diego. WIISARD will have interlocking software/hardware systems linked by a location-aware system and an advanced wireless Internet networking infrastructure. For example: - The patient system includes an RF tag that includes a bar code to identify the individual and his/her triage classification category (immediate transport, delayed transport, or walking wounded), medical sensors (using a finger-tip pulse oximeter to monitor the degree of blood oxygen saturation and the pulse rate), and the unit that collects data and transmits it by 802.11, a family of over-the-air specifications for communication between two wireless clients. - The provider system relies on the PDAs that allow students to access transmitters on campus to communicate with and locate one another. In addition to the AFR system, which provides maps and locations for situational awareness, the PDAs include a subsystem called the Provider Handheld Record (PHR), which records data that can be transmitted to a central database via the 802.11 link. - The Medical Visualization System (MVS) will utilize all technological components of WIISARD to track and display the location of patients, providers and other medical assets such as transportation system. The ICMVS will include software that allows the command center to send asynchronous communications to individual providers or to all providers using an instant-messaging system in AFR. The system will also display data on the status of emergency rooms, critical care beds and regular beds in county hospitals. Imagine the unthinkable. Terrorists have released a toxic chemical during a Chargers game at San Diego's QUALCOMM stadium. There are hundreds of civilian casualties. San Diego's Metropolitan Medical Strike Team, which includes local fire and law enforcement, FBI, Emergency Medical System personnel, Hazmat, paramedics, public health personnel and health care facilities, responds by sending teams to the stadium. An incident command center is established outside the disaster area. Transponder devices are set up around the parameter of the site to collect data and transmit it to the command center. All first responders are wearing radio frequency (RF) tags that send their location to the command center. Each responder also carries a personal digital assistant (PDA), to communicate with the command center and with each other, to show the location of victims and other providers, and to provide maps of the hot, warm and cold zones related to toxic materials. Medical personnel immediately evaluate victims. An RF tag, placed on each victim, includes a bar code entry that indicates that patient's "international triage classification category" (immediate transport, delayed transport, or walking wounded). Once activated, the tags transmit data back to the transponder collectors that relay the information to the field PDAs and to the command center, providing an immediate view of the locations, numbers and types of different casualties. The sickest patients also get a medical sensor called a pulse oximeter. Placed on the patient's finger tip, the device measures the degree of blood oxygen saturation and pulse rate, which are measures of vital signs and an immediate indicator of a worsening condition. The readings from the pulse oximeter are sent to both the command center (for a central record and ability to deploy resources as needed if a patient's condition worsens) and to the PDAs carried by the field paramedics (so that they, too, can monitor changes in condition). The transponders that were set up around the perimeter of the disaster site also serve as an early warning sign of any contaminated victim who tries to leave the site. Command center members will use a Medical Visualization System (MVS) to maintain situational awareness. The system maintains information about the locations of hot, warm and cold zones; tracks and displays the positions of victims and their status; tracks and displays the locations of healthcare providers and transportation resources; displays alert conditions for patients and providers; sends messages to providers; and displays outside hospital status. Armed with this information, the command center can identify situations requiring urgent action and deploy resources as needed. For example, when a patient's pulse oximeter indicates a respiratory or a cardiovascular problem, the data is sent to the MVS, which displays the alert condition and the locations of patients and providers. The command center can then direct the nearest available provider to respond. If a provider moves to a location too close to the hot zone, an alert will be displayed and the command center will contact the provider and direct him or her to safety. An electronic incident database will record all patient positions, providers and other treatment assets over the course of the disaster. The database also records patients' vital signs, medical findings, and treatments administered by providers. The information in this database will follow each patient to the hospital where he or she will eventually be transported. Through a secure link, insuring patient confidentiality, hospitals will interface with the database to download the data. The command center will refer to the database information, availability of transport vehicles and hospital capacities to determine where individual victims will be taken for further treatment.